In today’s blog, we’re getting up close and personal with one of Capital Captions’ movie subtitlers, Chris Hemshaw. 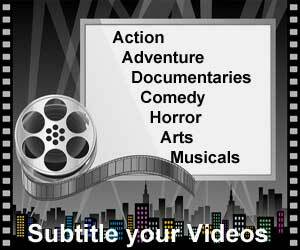 Chris has worked for Capital Captions as a movie subtitler since the company was founded in 2017. He works with broadcast and VoD movies and programmes, providing high quality closed captioning services and quality control of foreign to English subtitle translations. Prior to working as an English subtitler for Capital Captions, I worked for a financial services company, writing and editing content. Whilst I enjoyed the stability that permanent employment offered, I love to travel and wanted a career that was more flexible and working for a closed captioning company offered me that flexibility. In addition, writing and watching movies for a living is obviously far more interesting than reading up on financial services regulation and what continues to go on with PPI! I have a genuine interest in film and television programming, and have learned a lot working with subtitling companies over the years. I’ve learned to appreciate and look at video content from the perspective of deaf and hard of hearing audiences. I have captioned and helped with translation on documentaries, news footage and educational videos – something which has allowed me to expand my knowledge of the world. But overall, I’ve been lucky enough to have enjoyed some really good movies and TV shows. My all-time favourite film is Goodfellas. Now it’s true to say that I mostly like mob films so Goodfellas has to be at the top of my list. If you haven’t seen it, Goodfellas tells the story of a young man growing up in New York, trying to advance himself through the mafia ranks. Goodfellas, unlike many other mobster films, doesn’t try to glamorize the world of mobsters but instead portrays the mob in a more realistic way. Spanning across 25 years, the film concentrates on the subculture of depravity and greed which ultimately leads to the characters’ downfall. My second favourite film is Casino. Casino. Much like Goodfellas, tells the story of the mob but this time focusing solely on the 1970’s. It’s predominantly about how the mob took control of Las Vegas as an up and coming new city, using casinos to make big bucks. The film is seen from the perspective of the main character Sam Rothstein (Robert De Niro) who starts off as a low level mobster and is quickly hired to run the Tangiers casino. Again, much like Goodfellas, it follows the mobster’s rise and fall when they rules Las Vegas. My third best film of all time has to be the Martian. Although relatively new, it’s got all the fundamental elements that make an all-time classic. It looks into what it would be like if humans visited the red planet and someone got left behind. The film follows the struggles of astronaut Mark Watney (Matt Damon) as he struggles to think of innovative ways to prolong his life on Mars until he can contact and get help from his co-workers back on Earth. This film is both intelligently put together and well thought out. The ideas of growing his own root vegetables and then rationing them to last as long as possible is plausible, and apart from the very end where he has to jettison from his spacecraft and manoeuvre himself like superman to the waiting shuttle above, it mostly makes some logical sense. Apollo 13 is another of my favourite films. It’s based on the true story of how the seventh space mission to the moon and the third intended mission to land on the moon went tragically wrong and almost lost the lives of three astronauts. The film tells the story of how NASA scientist worked tirelessly to think of solutions to bring back the stricken ship after their was a catastrophic explosion through the space ship which meant they could not land on the moon. The Matrix follows Thomas Anderson (aka Neo), as he drifts his way through life, waking up to find out that the world has been taking over by artificially intelligent robots who have come to enslave the human race purely for the purpose of using them as batteries. The protagonist transforms from being an untrusting, hermitized computer nerd in the Matrix to being recognised as ‘The One’ that will save the entire human race and eventually wake up all of the sleeping humans from the very Matrix he himself was trapped in. So there you have it, my all time list of films which I love. If you’re thinking of becoming movie subtitlers or a film captioner, why not visit our work with us page and apply today.